With all the GREAT news this off-season it might be easy for a Stars fan to get caught up in the new, and potentially forget the old — but how could we forget about the greatest line-mates in all of hockey? Jamie Benn and Tyler Seguin are two of our young leaders on this awesome team and last year they showed just how awesome they can be! So, show your love and your Benneguin’s pride! He shoots! He scores! 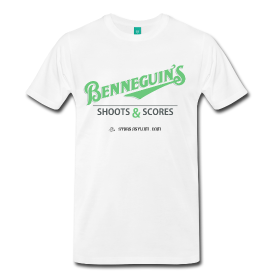 Here is a shirt to help you celebrate the best line mates in hockey! We <3 Jamie Benn and Tyler Seguin! Put on your jersey and grab a beer! Time to test what Jim Nill has done. With the awesome addition of Hemsky and Spezza, Our opponents should be fearful! I really think our Stars are aligned! I can’t say enough about Fiddler and Roussel. They give our team a spark, I hope they both do well. But worry? Right now I have no reason. We fans are super excited and hyped up! Tonight begins our quest for the Stanley Cup! Poem for 4/21: Playoff Hockey in Dallas!!!! Playoff Hockey in Dallas Tonight!!!! The will to win for our team must be strong. It’s not easy to be down by 2 games. But our team has been able to make some small gains. Garbutt & Eakin, Sceviour & Seguin! The energy will be high, there will be no reason to yawn. We’ve got to get ourselves a win. Put on your victory green and jump up! The Stars are playing for the Stanley Cup! While this fantastic poem was written and submitted before Game 3 of the Western Conference Quarter-finals, I didn’t get into the system to publish it until this morning. Please don’t blame the author for my delayed publishing! Excitement Boiling Over? Not Yet, But It Is Time to Get Your Hope Up! The fan-base of Our Dallas Stars has taken its share of kicks to the shin over the past few years. For good reason, a lot of The Faithful have put away their signs, their uniforms, the hair-color and face-paint. But in November of 2011, a new owner was approved for the team, and there was reason for at least the potential of optimism. But he took his time, letting the current organization run its course, watching to see where changes needed to be made – frankly, proper due-diligence. Somewhat surprisingly, though, it wasn’t after the 2011-2012 season that changes were made.But at the end of the 2012-2013 season, it was time. Our new owner decided his evaluation period was over and it was time to start making the organization in his image. Oh my goodness, has he! New GM – fantastic choice. New coach – probably a good move, time will tell. LOTS of new players, big moves – a lot looks good on the front end, but as with all player moves, time will tell. New jerseys – some like more than others. And as we work our way through those decisions, I gain more and more confidence that this organization is in fact going in the right direction. The fun part is Thursday night, we get to start seeing how it all plays out on the ice, start getting data and real information – then we can see how leadership reacts to it! That is a lot of changes to review, and some of it is not as time-sensitive as Thursday night, so I am going to be more cursory on some of it, saving bandwidth for the changes we are going to see the most on opening day. But the overall view from the cheap seats? Get excited as the beginnings of something wonderful are in the works, and if nothing else, we have a straw stirring the drink with the sole goal of winning and championships for YOUR DALLAS STARS! So now is the time – get out your face-paint, your favorite sweater, your cough-drops; start making those signs for the new players and dust off the old ones for the retuning players and the team as a whole; get ready because Thursday night is a mere hours away! R. Thomas Gaglardi is in some ways perfect. A Canadian with a Canadian’s love of the sport, but who has local ties. No one doubted that he would come in and make changes. The question was the quality of the changes, and to the extent possible, whether he was being over-involved. The GM move was – in this writer’s estimation – brilliant. You simply could not have made a better choice than Jim Nill, and it reflects very well on Gaglardi that he was able to close a deal with Nill as he had turned down numerous opportunities elsewhere to come to a franchise that wasn’t one of the Original Six, no matter the power of the sports market or the fact that you had clear data points of how that market would react to a champion. This writer, on the other hand, is not a jersey-buff. Unless a jersey change is Atlanta Thrashers-ugly, I will probably be okay with it. I came to love the Stars during the early years, so I will always have fond memories of those early sweaters, but I wasn’t turned-off by the black-themed stuff, nor am I put off by the new green sweater or the new logo. I do note that many thing that it is a more traditional hockey look, and I am okay with that. If I had an opinion, I think a stronger – deeper, darker – green would be a better choice, but I’m not sure I even care that much. As mentioned above, getting Nill was a brilliant move on paper – the brightest mind from one of the most storied, and most successful of NHL organizations. But as we evaluate him in what he has done, we have to look past the initial impression, to the actual choices. A major trade was made with the recent Stanley Cup runner-up, leading to the acquisition of some major talent. The biggest piece is Tyler Seguin, a phenomenal talent that had struggled to find a comfortable role for the Bruins. Now he gets a chance to be the young talent that is the beginning of the second Golden Era of the Dallas Stars. Question is, will he? Another major acquisition was Sergei Gonchar. Is this is the blue-liner that had been missing from the Stars for many years? On paper, absolutely. Other player moves were also made, but at the end of the day, those were the biggies, along with naming Jamie Benn the Captain. This brings us to the other big move by Nill – the coaching staff. Jim didn’t get his top choice, but he did get Lindy Ruff, a well-respected coach who, ironically, lost in his only Stanley Cup appearance to our very own Dallas Stars. The big question here is will Ruff be able to mold the roster that Nill has put together and turn them into a playoff team? Again, on paper, his history with Buffalo looks like the answer is yes. In this writer’s opinion, I do not see the Ruff hiring in the same light as Nill’s. In some ways it is very simple – he wasn’t the best option available. On the other hand, does he have to be? Do we really think that the current coach needs to be the guy we think will lead this team back to getting the names of the Dallas Stars back on the Stanley Cup? Or is this the guy to mold this current crop – this new foundation, a mix of old and new – into something that Nill can then add to over the course of a set of seasons to building from bottom third to middle third, setting the table for another seismic shift getting into that top third and eventually a Cup contender? The Buck Showalter to Ron Washington maneuver, if you will. In that light, I think that we are looking at a “good enough” move, with the potential to be more. Who knows – maybe Ruff can be the guy to shepherd this franchise back to the Land of Lord Stanley? But even if not, he can at least help get things going in the right direction – because there are very few Jimmy Johnsons. So this is why Thursday night is so exciting – the potential energy of all those moves finally gets to apply pressure on the kinetic energy of reality, and we get to find out how players perform together and for their coaches. It is here that we can start to really judge them and the coaches – the action-reaction of live play. So like I said, break out the sweater, the goalie mask, the signs and yes, your hope. It IS time to get your hopes up. True, they may be dashed again, but that is the nature of being a fanatic. But I have faith that this owner, this general manager and this coach are worth of the faith that they will be good stewards of your hope, and let hockey happen!